I use games in my Intervention Sessions all the time. My students need more practice than most, so the games provide the fun, repetition and motivation they need to learn. I begin and/or end the session with a game because the bulk of the session is usually quite intense, focussing on whatever skills they need to develop. You can include the game in a Maths Centre and you will find most students will want to play it between RTI sessions, which is ideal. You can mix the ability groups because the Bingo Boards have the multiples ladder on the side for those kids who need more support. 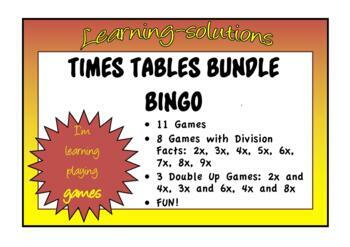 I have developed 10 Bingo Boards for each package because it doesn't take much longer than doing the 6 that I need, and it provides you with the ability to cater for up to 30 students, with 3 in each group. Each student can have 3 counters to cover their board and they all feel involved this way. It's the perfect way to mix ability groups as group members support each other in an effort to win. I have added the Chance Cards for the fun element. You can take them out if you like, but kids love them and it makes them think backwards from the answer to the number fact. I laminate all my games and they last and last. You get great value out of putting in the time at the beginning of setting up your resources as you will use them over and over and there is no prep again. They will pay for themselves and you won't be copying worksheets. All the Number Facts Bingo Games have a different motif linking the boards and cards, so if you buy them in a bundle you won't get them mixed up either. The Double-Up games were developed because some kids need more scaffolding and the Double-Ups provide that extra support. Go for it - play games, have fun and learn at the same time. This is the perfect bundle for schools and RTI.